I was so excited after reading this book. Finally publishing has caught on to the concept of diversity. There are characters of all different races and the main character is an African American boy named Emmett. Reintgen has written a fabulous book. I was drawn in immediately. This book starts out strong and gets stronger and stronger. I couldn't put it down and the ending! Omg. When Emmett and the others are recruited by Babel Corp to go to Eden they had no idea what they were in for. Babel Corp is not all that it seems and is definitely hiding things. 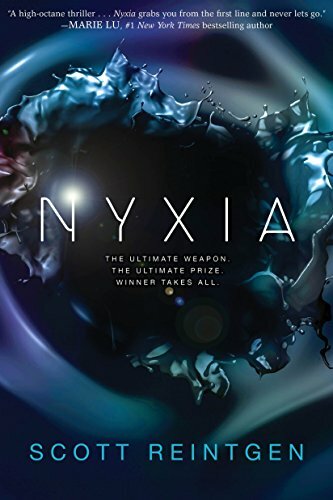 Emmett and the others are pitted against each other in a form of the Hunger Games and the strangeness of Nyxia. They are trained to fight, to mine and control Nyxia. They learn about Eden and the people who live there but all for what purpose? The unknown motives of Babel corp remind me of the movie Avatar. Is Nyxia special to the people of Eden? What is Babel really doing on Eden? What are the people of Eden like? So many questions! I hope book 2 doesn't take too long to come out. I would definitely recommend this book to anyone.